The MK8700 Smart Series Riflescope is the latest addition to the Aries Night Vision Weapon scope line. 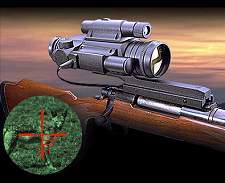 By utilizing the current military designs we have developed the most advanced NVD riflescopes commercially available. Our new "Red on Green" rear projection aiming system provides the user with a sharp reticle allowing fast and effortless target acquisition. 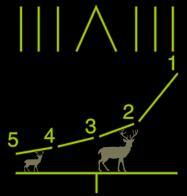 This system increases the reticle sharpness by 600% over standard NVD riflescopes. Combining this with a 1/8 M.O.A. internal windage elevation system the Mk 8700 is the ultimate choice for Law Enforcement Professionals or the Hunter that insists on his equipment being the best. The c in MK7800c, stands for compact. The Aries Defender is one of the most compact high-end night vision scopes you will ever find. Utilizing either a top grade US 3rd gen (7800c) light intensifier tube the Defender has an extremely sharp resolution and brightness. This compact marvel is not a stripped down NVD it is full of features such as a new super fast front lens system for optimal brightness, easy push button operation, and a reticle brightness adjustment. Plus, it comes with our new detachable, most powerful in the industry 450mw Infrared Illuminator with dedicated windage and elevation adjustments for total darkness usage. Compact, rugged and highly accurate makes the 7800c Defender the perfect scope for the person on the move. Diopter adjustment ±5, Operating temperature -40°C to +40°C. Includes Two Lithium Batteries, 450mW Long Range IR, Special tool/Wrench. Two year manufacturers warranty. When most people think night vision, they think expensive. 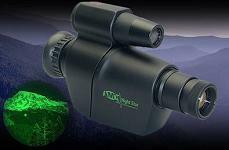 That's why at ATN we are proud to have created the perfect night vision device, it's called the NightStar. Why it is perfect, you might ask. The answer is simple. The NightStar provides the user with superior clarity and the highest possible light gain of a first generation night vision device at minimal cost. Also the unit comes standard with TOTAL DARKNESS TECHNOLOGY which will power up a powerful infra-red illuminator when you come into an area with no ambient light. This NightStar is perfect for camping, boating, or home security. If you want to further the capabilities of the unit, you can add a camera adapter (fits 35mm and video) or doubler (doubles magnification). Two year manufacturer warranty. "Smart" tech, Total darkness tech - Standard, Diopter adjustment +/- 5, Magnification 1.5X (Optional 3X, 4X, 8X), Intensifier tube High Res. 1st GEN +, Detection range 150m, Recognition range 100m, Light gain 35,000 MAX, Lens system 6 (9) Element, F1.2, 35mm, FOV 20, Resolution 40 lp/mm, Range of focus 3' to Infinity, Controls Direct, Power supply One 3 Volt Litium, Battery life 10-20 Hours, Dimensions 137 X 87 X 43 mm, Weight 9.5 oz. 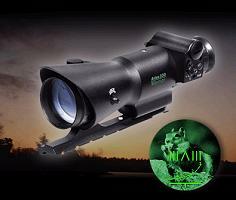 ATN Night Leopard Night Vision Spotting Scope - 1st Gen.
See Like a Cat in the Dark! 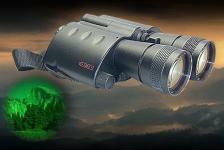 Our new NIGHT LEOPARD is a Top-Notch Compact Night Vision Monocular. A new super fast lens system combined with a high resolution Gen. 1-Plus light intensifier tube gives the user an unparalleled bright image in a 1st gen. night vision device. Easy push button controls, 3x magnification and a built-in infra-red illuminator for viewing in total darkness are just a few of the features this scope packs. 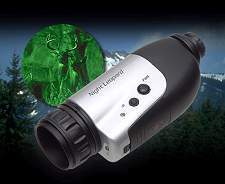 If you want a compact, high quality night vision monocular then look no further then our new Night Leopard. Two year manufacturer warranty. Detection Range 200 m/y, Recognition Range 100m/y, Lens System F1:1.2, F50mm, FOV 14°, Diopter Adjustment ±5, Resolution 40 lp/mm, Power Supply One 3 volt lithium, Range Of Focus 1m to infinity, Controls digital, Battery Life 10-20 hours, Operating Temperature -40°C to +40°C, Weight 1 lb. Magnification 4x, Intensifier Tube High res. 1st Gen, Detection Range 250m/y, Recognition Range 150m/y, Lens System F1:1.7, F90mm, Diopter Adjustment ±5, Resolution 40 lp/mm, Power Supply One 3 volt lithium, Range of focus 20m to infinity, Controls digital, Battery Life 10-20 hours, Operating Temperature -40°c to +40°c, Dimensions 9.5" x 5" x 3.5", Weight 3lbs. Magnification 5X, Intensifier tube high res. 1st.GEN+, Detection range 150m (250m), Recognition range 100m (175m), Light gain 35,000 max, Lens system 6/9 el., 90mm,F1.2, FOV 20 deg., Diopter adjustment +/- 5, Resolution 40 lp/mm, Power supply 2x3 volt lithium battery, Range of focus 20' to infinity, Controls Digital, Battery life 10-20 hours, Dimensions 225x150x60 mm, Weight 3.3 lb. 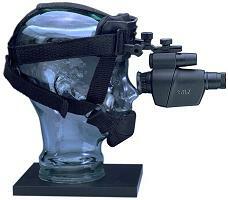 ATN Night Cougar Night Vision Goggle System - 1st Gen. The night cougars are a light weight dual eye/tube goggle system that are comfortable to wear and easy to use. Powered by two high quality 1st. gen+ light intensifier tubes and using fast precision optics the Night Cougar has one of the clearest and brightest images available in a 1st gen goggle. Combine all of the above with a built in infrared illuminator that lets you see in total darkness and you will be on your way to exploring even the darkest of places. Total darkness technology Standard, Magnification 1X, Intensifier tube high res. 1st gen+, Detection Range 150m/y, Recognition range 100m/y, Lens system F1:1.4, F35mm, FOV 30°, Diopter adjustment ±5, Resolution 40 lp/mm, Power supply one 3 volt lithium battery, Range of focus 1m to infinity, Controls digital, Battery life 10-20 hours, Operating Temperature -40°C to +40°C, Dimensions 137mm X 125mm X 50mm 5.5'' X 5'' X 2'', Weight 0.8kg / 1.75 lbs. Included Accessories: Soft carrying Case, Packing box, Instruction Manual, One Lithium Battery, Video Guide. 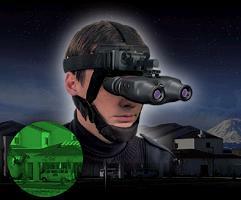 If what you need is a hands free night vision, we at ATN have the unit for you. We would like to introduce you to the ATN Viper modular goggle system. Designed primarily to be a goggle system for hands free application, this unit can also be used as a compact monocular or can be attached to a camera for night time photography. 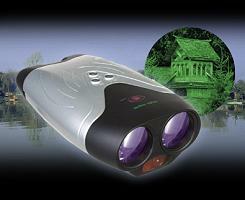 This high resolution 1st Gen.+ night vision unit comes with 1x magnification, but has the option of being 4x or 8x. Surprisingly, even though we gave the Viper a heavy coated glass lens, we were still able to keep its weight down to only nine ounces. So for any activity you plan on doing which requires night vision and hands free operation, the Viper delivers superior results. Magnification 1X Standard (4X or 8X optional), Intensifier tube 1st Gen.+1 high resolution, Lens system 35 mm,F1.0, Resolution 40 lp/mm, Min. light req. 3x0,001lux, Focal Range 1' to infinity, FOV 14 deg., Diopter +/- 5, Battery life 8-10 hours (continuous), Power supply 3 volt lithium battery, Dimensions 5" x 2" x 1", Weight <1 lb. Two year manufacturer warranty.